Some people say RadioShack is just a store … But to me it was an idea — a learning and resource center that really shaped people’s lives. I remember countless days spent working on an electronics project, where I made many trips to the local Radio Shack for components. It was exciting to learn about photocells, electromagnets, diodes, transistors, etc. Sometimes these projects would last weeks on end. I was always taking things apart (and in many cases never got them put back together!) much to my parents’ chagrin. I recall only very few of my peers frequenting the store… so it is nice to see this article put a face on the real impact RadioShack had on people’s lives. I never really realized the magnitude RadioShack had on others until I read this article. I went on to study Electrical Engineering and Computer Science, and in a real way, my tinkering has turned into a marvelous career. He also pored over the RadioShack catalog the day it arrived, studying up on what was then cutting-edge technology — reel-to-reel tape decks, fax machines — and the pages and pages of arcane electronic components. 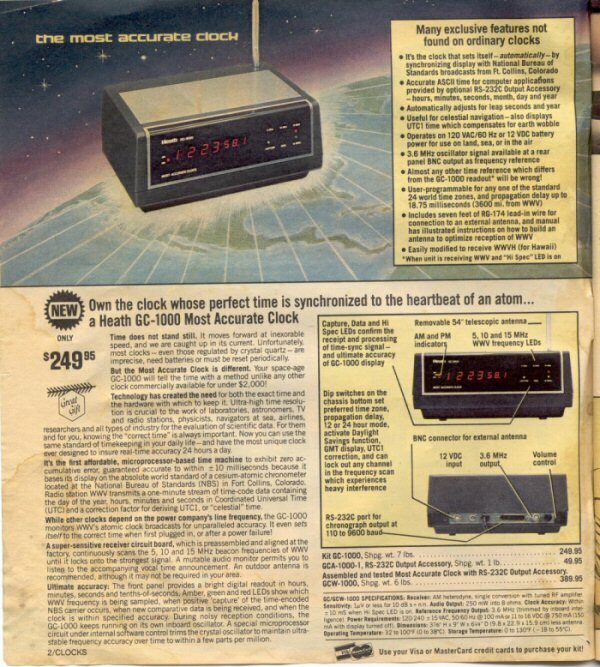 Oh, how I lusted over the GC-1000 Most Accurate Clock (I finally purchased a used one on eBay a few months ago). The books were written exclusively for RadioShack and were offered in stores for a few dollars each. They were essentially giveaways; the real money came from all the diodes, transistors, and tools that hobbyists needed to build the circuits he diagrammed. 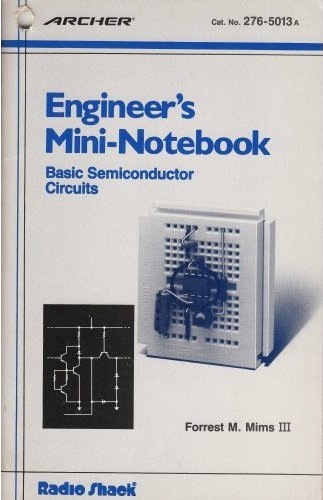 Remember the Engineer’s Mini-Notebooks? These were always filled with great projects, and circuits, that could be used to build a multitude of gear. I was always interested in radio, and built all kinds of receivers and transmitters. One of the neatest projects I made was a digital voice synthesizer, that took its input from and 300 baud serial line. Now that was cool! Over the years, I got interested in Ham Radio… especially packet radio. There was just something so neat about sending digital messages to others across the country with a TeleVideo 925 dumb terminal, a MFJ packet radio, a Yaesu 2m ham radio, and a homemade J-pole antenna on the roof. Of course, many of the parts that made it work were from RadioShack. That about sums it up. Except for the fact that my folks now think this video clip “The Knack” pretty much sums up my childhood. Update 7/14/10 – I came across this similar retrospective, Raised, in part, by Radio Shack. Good reading. Your comments brought back many memories. I was a longtime Radio Shack employee. Started when they had 35 stores when I was 16 years old. I was responsible for the 27 series (all the parts) as the product manager for those products. The Project Boards were my creation that helped people build simple items. Most people do not know that the original version of the TRS-80 was a project board, though never released. Because we received many Project Boards back from customers that were soldered solid or just not working, I decided to convince the company to introduce a completed home computer. That took a lot of doing with my job being threatened several times if I was working on that &@*^* computer. To find out more about the TRS-80 and how it came about, google for Don French and TRS-80. It is a very interesting story. In fact, if you sit down and think about the market then, you will realize that without the TRS-80, there would not be the Personal Computer industry that there is today. Apple was a small company with little money and could not have created the interest that Radio Shack did. Thanks for your comment Don! I’m glad I could bring back some memories. Although, the Wired article is what started it all. Make sure you check out the other blog post linked above, “Raised, in part, by Radio Shack,” if you haven’t already. The work you did for the Project Boards and the TRS-80 was awesome. I was one of the many who benefited from your labors, thank you. My parents purchased a TI-99/4A in the late 70s, so that was my hobby computer in the early 1980s. We did have some TRS-80s at school along with a complement of Apple and IBM equipment. I did a little searching as you suggested. Great reading. Although, I was hoping to find a retrospective written by you. You obviously have some great stories to tell. So, if you have some time it would be great to get “your” story. Thirty-three years ago today the TRS-80 was announced. The article is worth a quick read. It’s nice to read that the article in WIRED magazine has reached so many people. The feedback I’ve received and the numerous post-article comments in the blogs and forums helped me to realize that Radio Shack truly shaped MANY people’s. I was not alone. Radio Shack was a place that stimulated my interest in general electronics, inventing electronics gadgets, and just taking something apart to see how it’s made. To this day, the BEST Christmas gift I received was a 75-in-1 Radio Shack Electronic Kit. I can’t tell you the countless hours I’ve spent using that kit. And after I built and learned about all 75 projects in the kit, I started to make my own projects. I don’t think Radio Shack Corporation ever realized the power of their store or catalog. Thanks for plugging my website. Please visit often. Hey Mike. Thanks for posting your comments. I thought I was alone too, until very recently. I kind of mentioned that in my blog, but now I know there were so many lives shaped by Radio Shack. For every hour I spent in the store I probably spent at least 20 hours dissecting the catalog. The catalogs were the face of Radio Shack for so many years. Your site is great, and I encourage all to spend a little time there. I just purchased some additional Tandy computer catalogs I was missing and hope to have those on my site in the near future. And if any of your readers have old Radio Shack catalogs or relative information that my site is missing, I would appreciate an email (rscatalogs -at- gmx -dot- com). Donations are great, but I am willing to purchase what I don’t have. I’m just trying to keep my site “fresh” and keep alive the memories of Radio Shack’s days-gone-by. If they only experienced the knowledge and enjoyment that you, me, and countless others have growing up, they would know why. Here in the UK the Radio Shack brand was sold by Tandy stores. As an electronics obsessed kid one of my favorite birthday presents was a 50 in 1 project kit purchased from Tandy. The kit comprised a number of discreet components mounted on a breadboard that had their terminals attached to small springs. The springs were used to connect wires to produce a number of exciting circuits ranging from light flashers to radio transmitters. Later on I bought the classic tennis TV game console from the store with the proceeds of my first pay packet. Tandy stores had disappeared from the UK high streets by the 1990s. 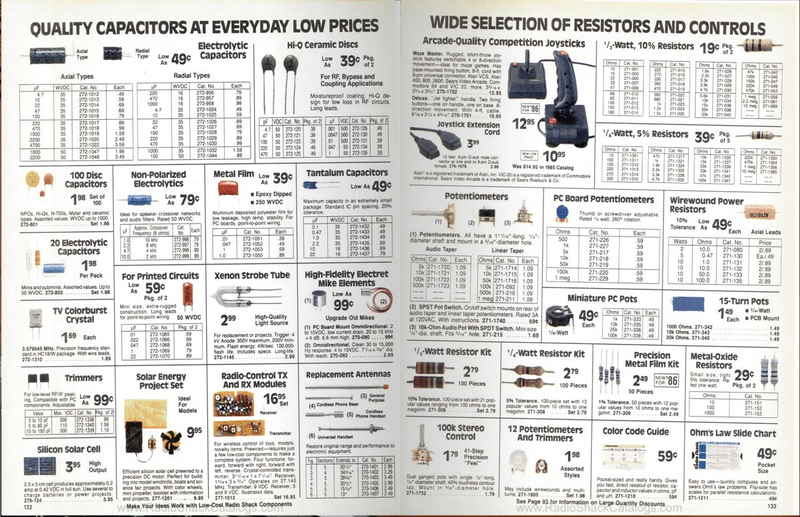 I always found Radio Shack products rather expensive (particularly components) but they did have some good special offers. Now, the main UK high street electronics retailer is Maplin which in many ways is similar to the old Tandy stores.